A good, clean, tight copy. A little worn at spine. Illustrated with photographs and drawings. Graphics director N Korobeinikov. Rodchenko influenced upper cover design. 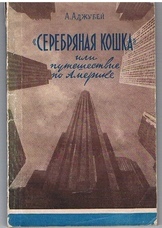 ; An an account of his journey around America by Alexei Ivanovich Adzhubei (Samarkand, 1924 - Moscow 1993). Nicknamed 'the King of the Soviet Press' in the 1960s, Adzhubei was Khrushchev's son-in-law. After Nikita Khrushchev's sensational exposure of Stalin's crimes and the millions of victims in the gulag, Adzhubei became 'journalist number one' and moved in 1959 as editor to Izvestia. He transformed the paper from a 'dull rag' into a lively, intellectually stimulating publication. 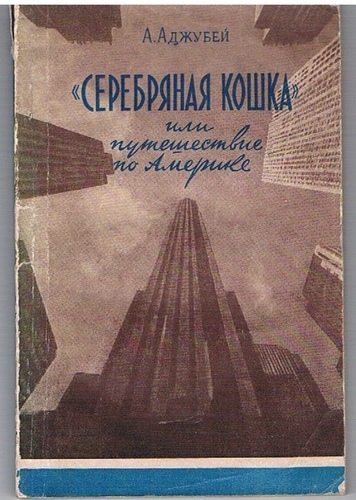 Serebryanaya koshka was published some 3 years before his epic 700pp work 'Face to Face with America'.